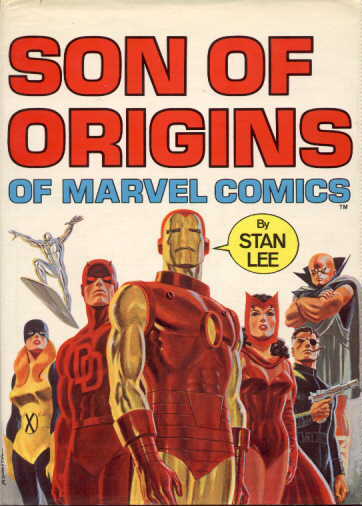 Back in 1974 Stan Lee and Marvel came up with the wonderful idea to compile the origins of some of their greatest characters in a book format, similar to what Jules Feiffer did with "The Great Comic Book Heroes" back in 1965. To the best of my knowledge, there were 27 different Fireside books produced from 1974 to 1980 and many books had multiple printings in both hard and softcover as I have noted after each book below. Marvel eventually began straying away from the origin stories and combined some of the greatest stories ever told dealing with individual characters such as Spiderman, Hulk, and Doctor Strange. 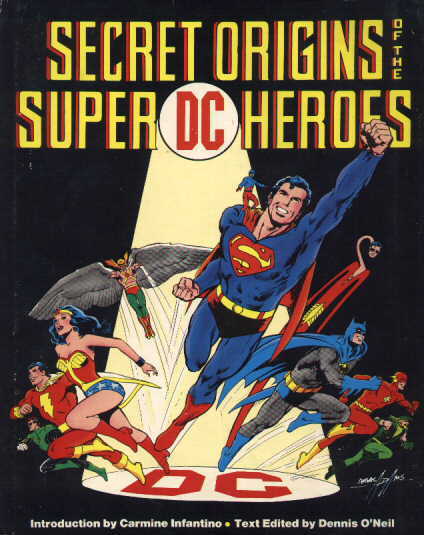 DC also jumped on the compilation book bandwagon in 1976with "Secret Origins of the Super DC Heroes" published by Harmony Books (hard and soft cover), and even came out with three Fireside books of their own in 1979 and 1980 with Heart Throbs - The Best of DC Romance Comics, America at War - The Best of DC War Comics and Mysteries in Space - The Best of DC Science Fiction Comics. 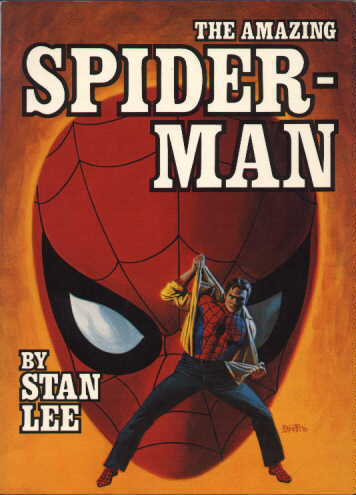 In 1983 Marvel put out a book titled "Mighty Marvel Team-Up Thrillers" which was printed "in house" by Marvel themselves, so this book serves as the link between the Fireside series and the80's and 90's generation of Marvel reprint books. The book lists all the previous Fireside Books on its title page and is the same size as these books, but is actually not a Fireside Book itself. I have collected these books for many years now and I am now giving notice to a long overlooked book series that has become very collectible over the past few years. 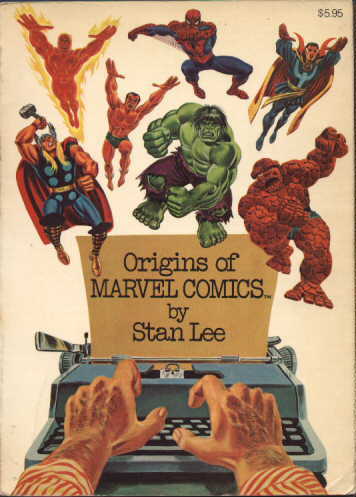 The first Fireside book in 1974 is entitled "Origins of Marvel Comics" and featured origins of characters such as Spider-Man, Thor, Doctor Strange, Sub-Mariner and the Hulk as well as super teams such as the Fantastic Four. 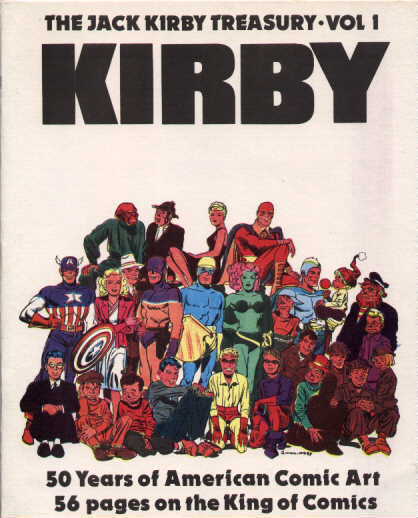 Stan Lee wrote all of the stories and Jack Kirby supplies most of the art in this book and shows why he is regarded as one of the greatest artists of all time! 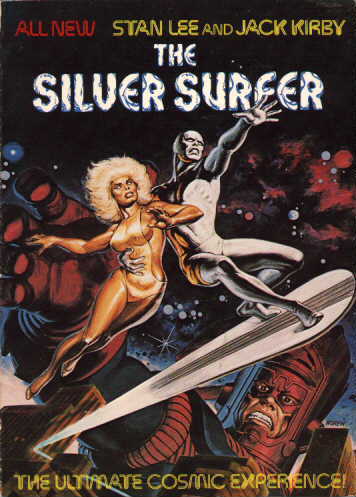 Features origins of such characters as Ironman, Daredevil, Nick Fury, Silver Surfer and the Watcher as well as super teams such as the X-Men and the Avengers. Again, most of the stories are written by Stan Lee with more incredible art by Jack Kirby amongst others such as Gene Colan and John Buscema. 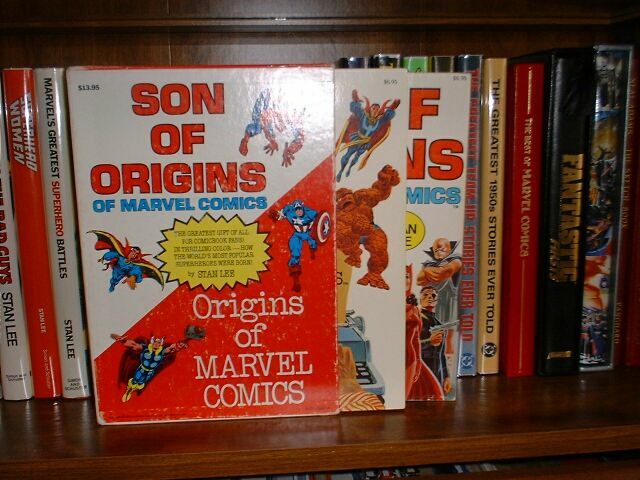 This 2 book set with slipcase were offered with later softcover printings of the Origins books and were advertised in various comics put out around 1977. 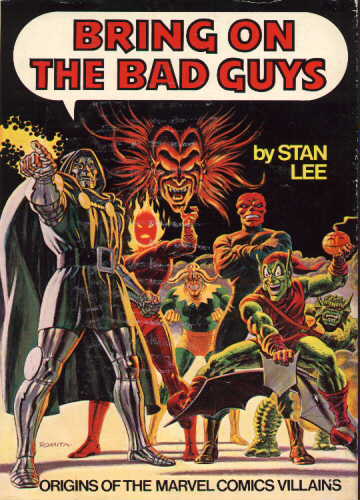 Features origin stories of some of Marvel's villains such as Doctor Doom (Lee & Kirby), Dormammu (Lee & Ditko), Loki (Lee & Kirby), Red Skull (Lee & Kirby), Green Goblin (Lee & Romita), the Abomination(Lee & Kane) and Mephisto (Lee & Buscema). 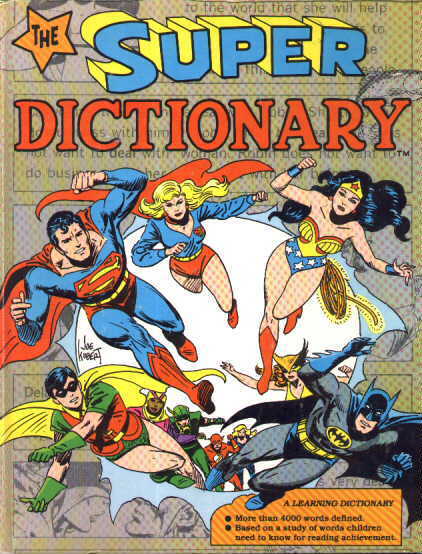 Until now children could only read about the Superheroes - with this book, they can become Superheroes. 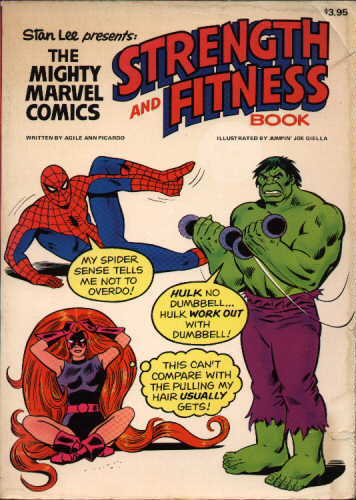 Learn to get in shape with Mighty Marvel: including the Incredible Hulk's pulsating panorama of body builders; Silver Surfer's posture and balance exercises; Spidey's Supple Sidewinders and the Spider Bounce; Fat-Clobbering Time, the Thing's tried and true tirade against lumps and bumps. 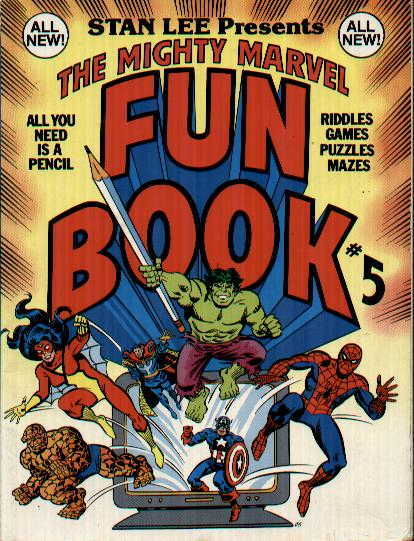 Marvel's greatest costumed characters help you sharpen your wits with some of the cleverest puzzles, riddles, and games you've ever seen! 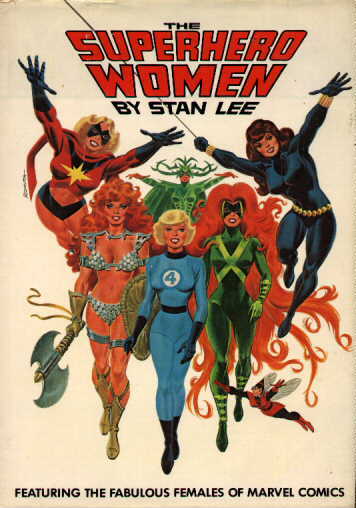 1977 saw the publication of "The Superhero Women Featuring the Fabulous Females of Marvel Comics" which featured Medusa (Lee & Romita), Red Sonja(Bruce Jones & Frank Thorne), Invisible Girl (Lee & Kirby), Ms. Marvel (Lee & Buscema), Hela (Lee & Buscema), the Cat (Linda Fit & Marie Severin), Wasp (Lee & Kirby), Lyra the Femizon (Lee & Romita), Shanna the She-Devil (Carole Seuling & Ross Andru) and Black Widow (Lee & Romita). 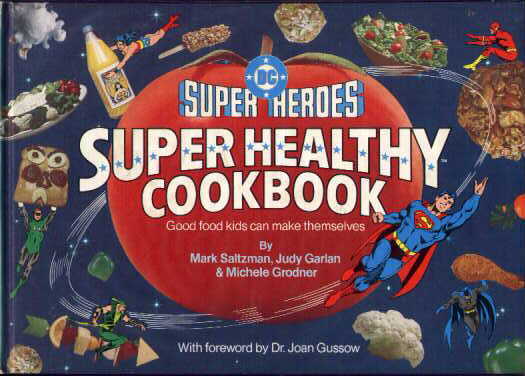 The Mighty Marvel Superheroes show you how to perform heroics in the kitchen creating meals that are out of this world! Included are such delights as Ka-Zar's Steak Kabobs, Captain America's Double Cracker Jack Cake, the Hulk's Hulkburger, the Thing's Clobbered Omelet, Mr. Fantastic's Jaw Breaker and Spider Man's Chocolate Web Pancakes. 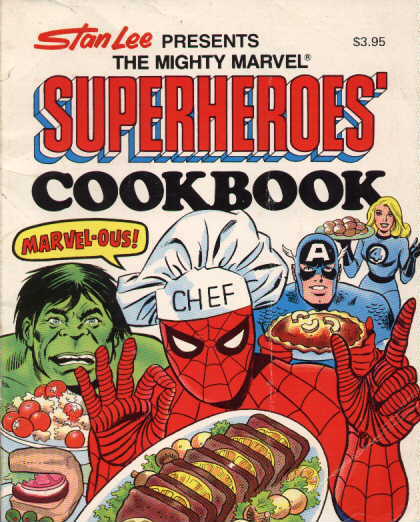 From soup to nuts, from breakfast to dinner, vegetables, salads, desserts and beverages, The Mighty Marvel Superheroes' Cookbook is filled with easy-to-follow, foolproof recipes. This is one cookbook that the entire family will enjoy. 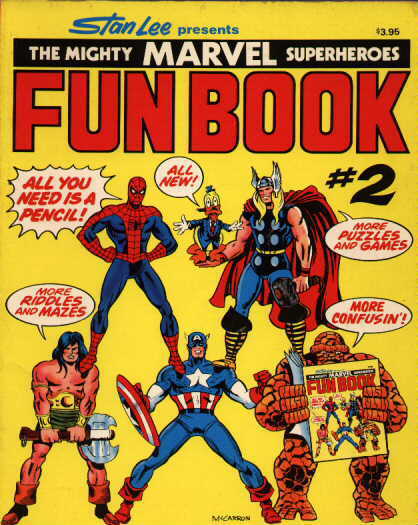 Stan Lee, the mighty man from Marvel, and John Buscema, active and adventuresome artist behind The Silver surfer, Conan The Barbarian, The Mighty Thor and Spider-Man, have collaborated on this comics compendium: an encyclopedia of information for creating your own superhero comic strips. 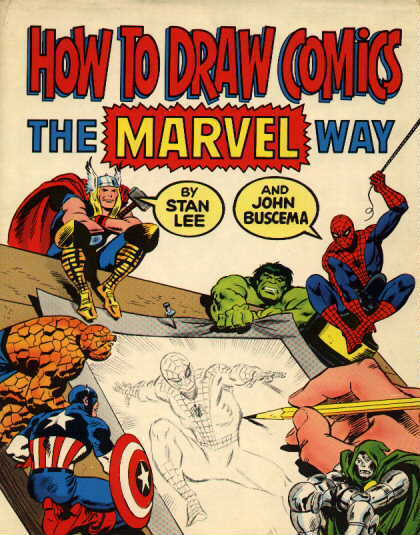 Using artwork from Marvel Comics as primary examples, Buscema graphically illustrates the hitherto mysterious methods of comic art. Stan Lee's pithy prose gives able assistance and advice to the apprentice artist. 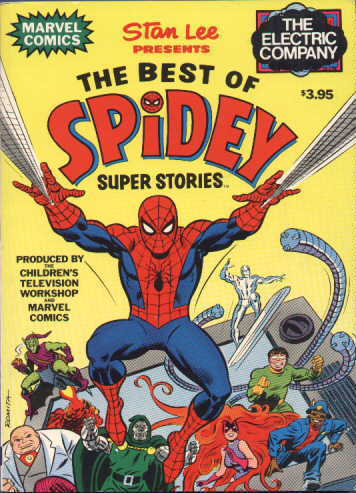 Produced by Mighty Marvel and the Children's Television Workshop (Electric Company), Spidey Super Stories is the very first easy-to-read superhero comic book, and some of the best issues are presented here. Silently streaking through the skyways of space he soars, one gleaming figure, endowed with power such as mortal man has never known, yet helpless before a specter of horror which threatens to destroy the entire human race! The Silver Surfer! Only he stands between the hapless planet earth and the menace of Galactus! Only he against the most terrible threat in all the universe. The most powerful mortal ever to walk the earth lashes out! 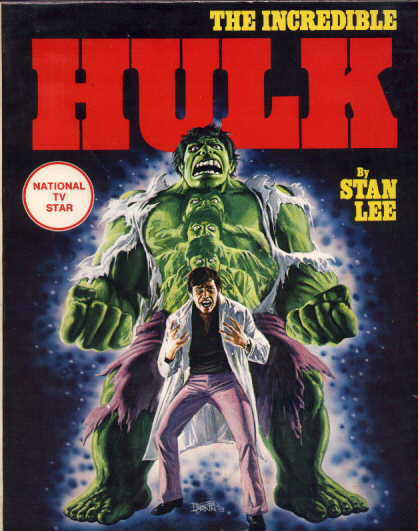 The Mighty Marvel Origins series continues with stirring sagas of the frail physicist, Dr. Bruce Banner, caught in the heart of a nuclear explosion, a victim of gamma radiation gone wild, who in times of stress now finds himself transformed into 7 feet, one thousand pounds of unfettered fury! Allow yourself to stand in awe of the man-brute's matchless might, but beware of The Incredible Hulk. From the dawn of Marvel memory - right up to the present - here are the answers to questions that have driven Marvel fans mad for years: Like who is stronger, The Hulk or The Thing? In a ferocious fight between Daredevil and Sub-Mariner, who would win or would it really take both Iron Man and Captain America to put old Subby down? Who talks funnier, The Silver Surfer or Thor, and are either of them any match in the battle of wits against the baddest of baddies, Loki, God of Evil? And in the wits department, is Spidey really the smartest superhero in the bullpen? 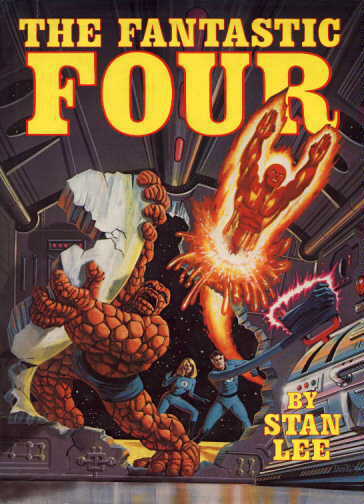 In this vast roundup of vintage victories come the colossal clashes of The Fantastic Four, The Original X-Men, Dr. Strange, and all your favorite faves who battle their way across the wide world and universe outwitting, outmuscling and undoing, each other - as only Stan Lee can do it. 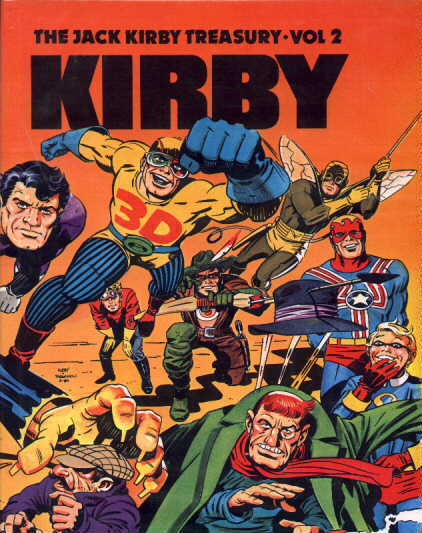 Art by Jack Kirby, Wally Wood, John Buscema, Gene Colon, Steve Ditko and John Romita. From the Living Legend of WWII to the straight-thinking, straight-talking, straight-shooter of the seventies. Here, in this copious collection, are the most exciting episodes of Ol' Cappy's career. 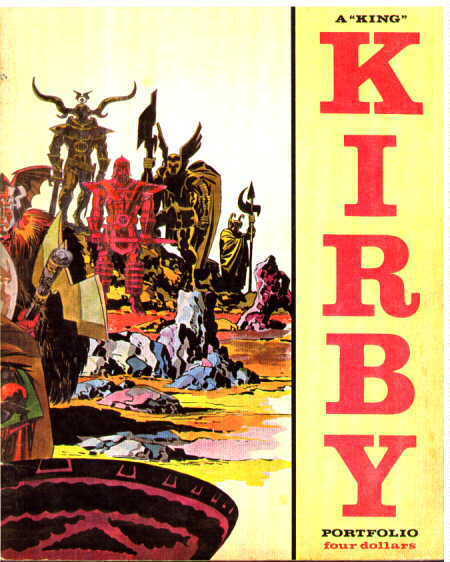 Most art is supplied by Jack Kirby with a Steranko and Gene Colen tale to boot. 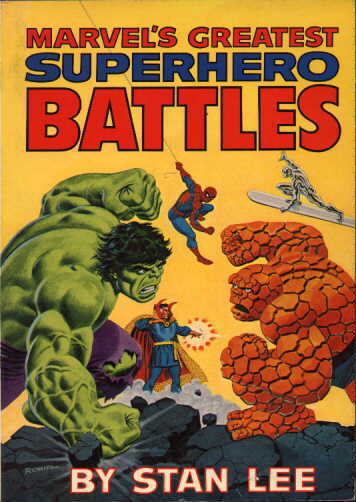 Every story in this volume is written by Stan Lee and drawn by Jack Kirby. Galactus, godlike devourer of whole worlds and the only being strong enough to stop him - The Silver Surfer - took their first bows in an episode of the Fantastic Four. And it was the fearsome foursome who reintroduced Prince Namor, otherwise known as the sensational Sub-Mariner, to the world of comics after a long, long absence. See the entire Galactus Trilogy here! In one copious collection for the very first time, here are the spectacular sagas that have made Spider-Man the most popular Marvel Superhero of all time. See how Spidey met Mary Jane Watson and the classic drug-addiction saga with spectacular art by John Romita and Gil Kane. Scarier than a swarm of sorcerers - spookier than the shades of the shadowy Seraphim - it's the spellbinding saga of Dr. 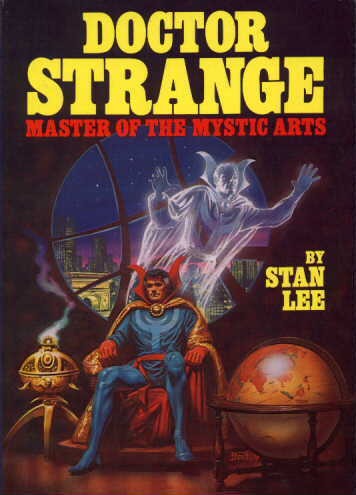 Strange, told through the most sensational stories of his supernatural career. From his first meeting with the murderous Baron Mordo, to his second encounter with the naughty, nefarious Nightmare, right through the stupendous spectrum of spine-tingling spats with the likes of Loki and Dormammu - it's all recorded in full color in this triumphant tome. Most of the stories are drawn by Steve Ditko with the exception of one by Barry Windsor-Smith. From Tomahawk to Sgt. 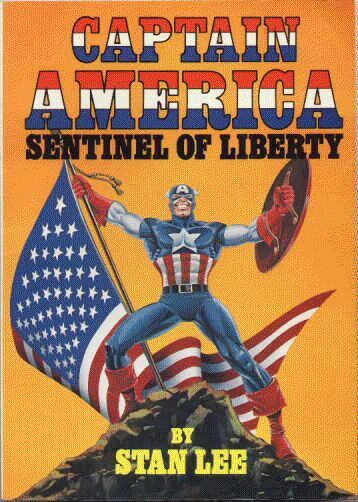 Rock, DC Comics has published the finest stories of America at war on land, sea and in the air. Hop Harrigan, Blackhawk, The Unknown Soldier, Enemy Ace, Gunner and Sarge, Mlle. Marie, Captain Hunter, The Boy Commandos, Jeb Stuart's Hunted Tank, Captain Storm, Easy Company and many more of the very best war comics are reprinted here (in full color) for the first time. 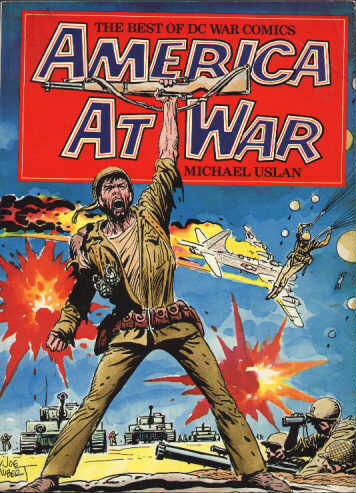 From the Revolutionary War to Vietnam, from wars in the past to wars of the future, the universal theme has remained constant: War Is Hell (even in the comics). 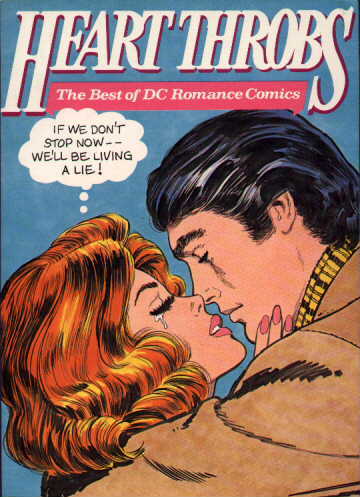 From the annals of romance comic history come the stormiest, most tempestuous, heart-throbbing stories about the rough, tough road to true love. 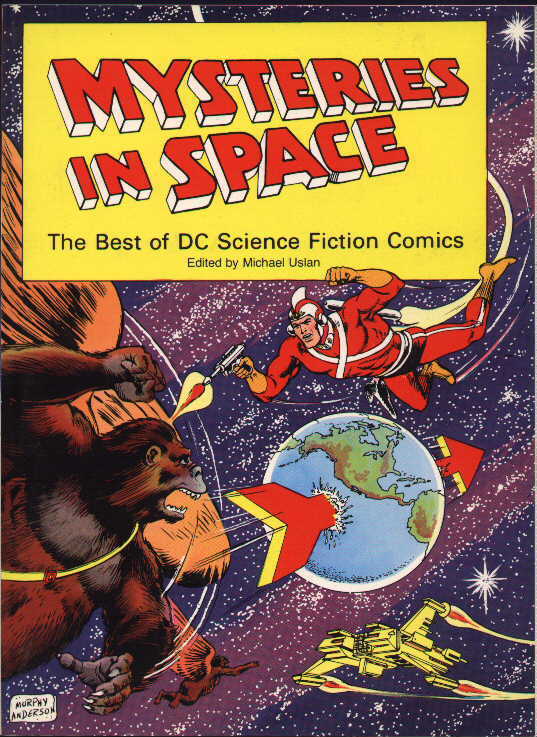 From the very center of the earth to the farthest edges of space, from the thrills of the near future to the last terror of recorded time - here in one fabulous collection are the best comic-book tales of science fiction ever published. 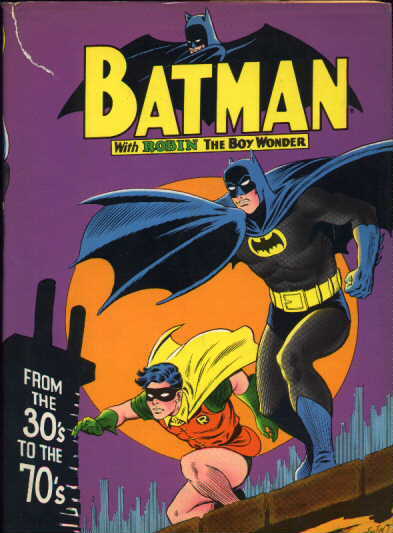 Produced by DC Comics from 1950 to the early 1960's, they are the works of the best and the brightest in the field - writers like Gardner Fox, John Broome and Otto Binder, and the fantasy-art greats like Carmine Infantino, Murphy Anderson and Frank Frazetta. From the earliest heart -wrenchers like "Do Not Open Till Doomsday" to the most famous thrillers starring Adams Strange, here is a taste of a golden age of science fiction that has not been equaled in comicdom - a time when there were giants and geniuses in the field. At last! The sensational, best-selling "Marvel Origins" series continues! Featuring the world's greatest superheroes in cataclysmic combat with more sinister, savage supervillains than you can shake a flying surfboard at. Brilliantly selected by Stan Lee, the smiling sage of the Marvel Age, as his own personal all-time favorite thrillers, you'll find virtually each and every one of our most popular artists featured within such as John Byrne, Jack Kirby, Jim Starlin and Steve Ditko. 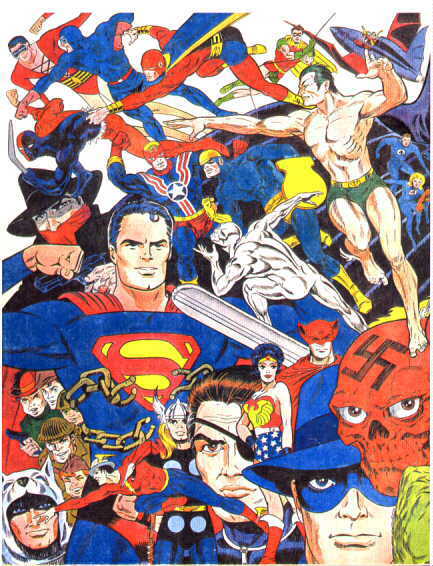 Origins of Superman, Batman, Green Lantern (silver and golden age), Wonder Woman, Flash (silver and golden age), Hawkman (silver and golden age), Green Arrow (silver and golden age), Atom (silver and golden age), Shazam, Plastic Man. 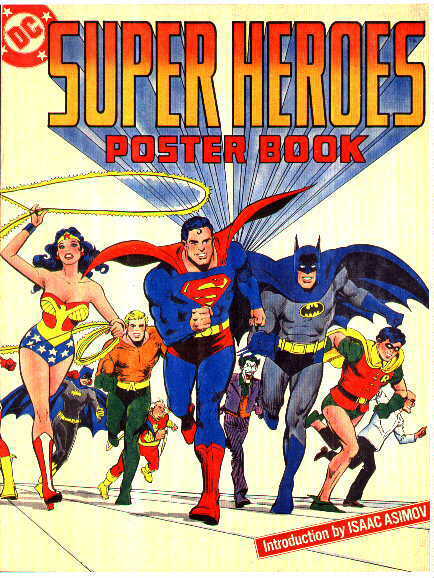 22 great giant size pin-ups of all your favorite DC superheroes, all in one book! 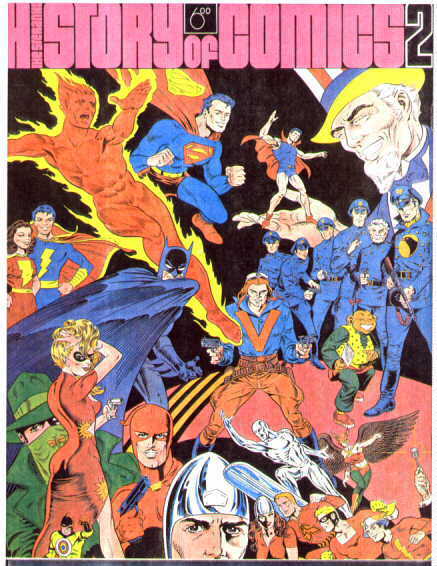 Origins and early exploits of Superman, Batman, Green Lantern,The Spirit, The Sectre, Sub-Mariner, Captain Marvel, Captain America,The Flash, Plastic Man, The Human Torch, Hawkman and Wonder Woman from the 1930's and 1940's. Here is a collector's treasury of classic adventures, spanning forty years, and never before published in book form. 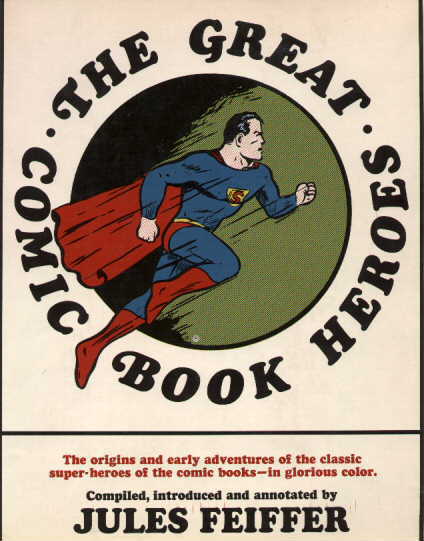 The book traces Superman's undisputed reign as champion of the comic strip in 28 full stories and 40 color cover reproductions. Batman from the 30's to 70's relives the spectacular world of the early comic books with over 25 action packed stories, fifty original cover reproductions, and exciting introduction by E. Nelson Bridwell, writer and editor of the Batman newspaper strip, and a complete biography of all the Batman's appearances. 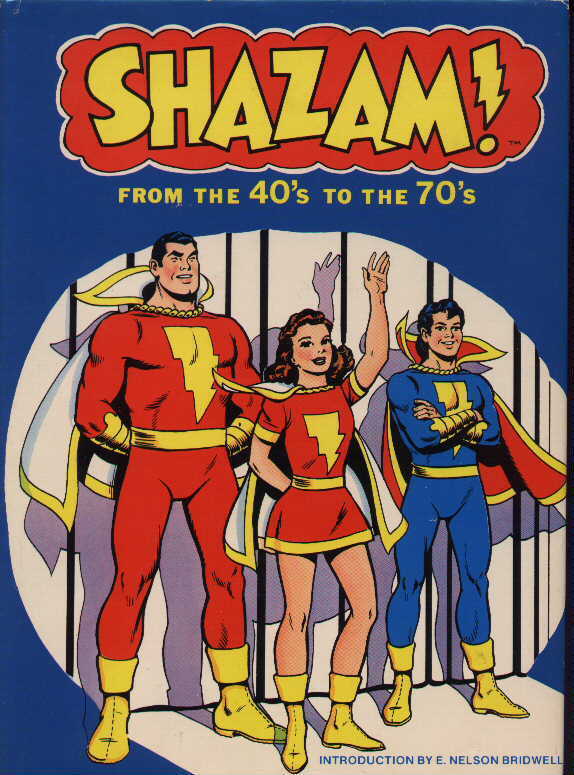 Shazam from the 40's to 70's relives the spectacular world of the early comic books with over 25 action packed stories, fifty original cover reproductions, and exciting introduction by E. Nelson Bridwell, and a complete biography of all the Shazam's appearances. 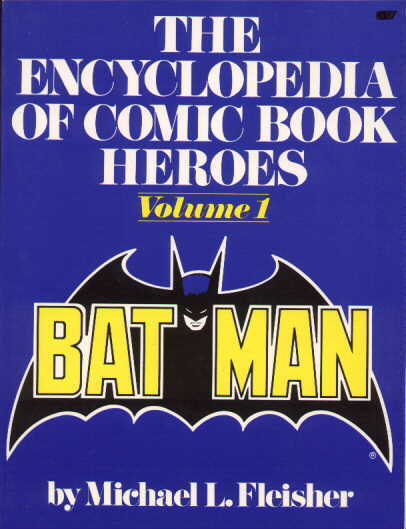 The Batman encyclopedia documents the first 25 years of the Dark Knight by extensive research done by Michael Fleisher and Janet Lincoln - comprised by more than 1,000 entries assembled in a convenient A-Z format and ranging from a few short lines to more than 100 print pages, it contains detailed accounts of more than 1,000 separate adventures. Also contains 220 illustrations called directly from the comics. 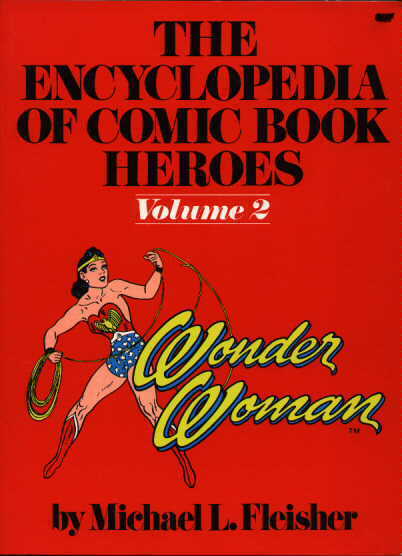 The Wonder Woman encyclopedia documents the first 25 years of the Amazon Princess by extensive research done by Michael Fleisher and Janet Lincoln - comprised by more than 1,000 entries assembled in a convenient A-Z format and ranging from a few short lines to more than 100 print pages, it contains detailed accounts of more than 1,000 separate adventures. Also contains 220 illustrations called directly from the comics. 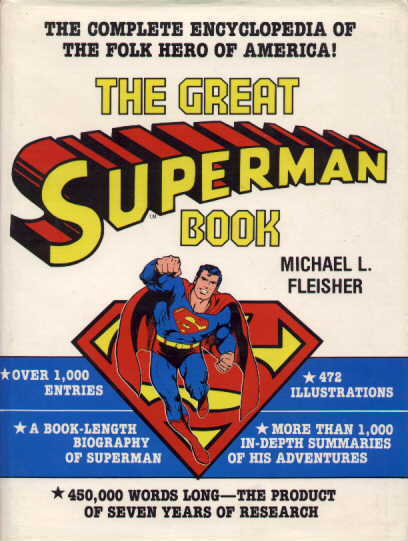 The Superman encyclopedia documents the first 25 years of the Kryptonian son by extensive research done by Michael Fleisher and Janet Lincoln - comprised by more than 1,000 entries assembled in a convenient A-Z format and ranging from a few short lines to more than 100 print pages, it contains detailed accounts of more than 1,000 separate adventures. Also contains 220 illustrations called directly from the comics. This great book traces Superman's history from the very beginning to the present, including movies, advertising and promotional items. Wisdom, strength, and love were the Amazonian qualities given to Wonder Woman by her creator, Charles Moulton, when he began the comic strip in 1941. For six productive years, his stories seduced and enchanted children of all ages. 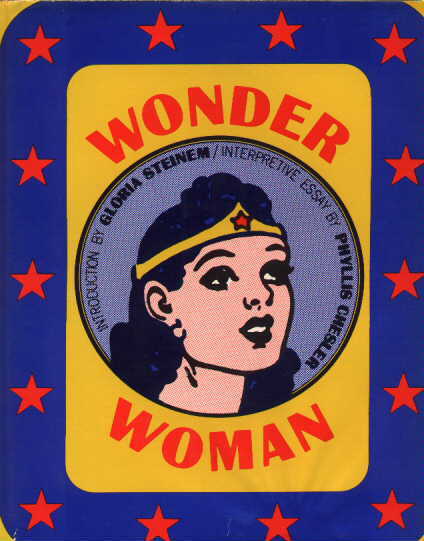 Now, in this collection of the best comics from the 1940's the Golden age of comics, Wonder Woman lives again. This great book reprints "Captain Marvel Adventures" numbers 22-46 (1943-1945) in beautiful full color. 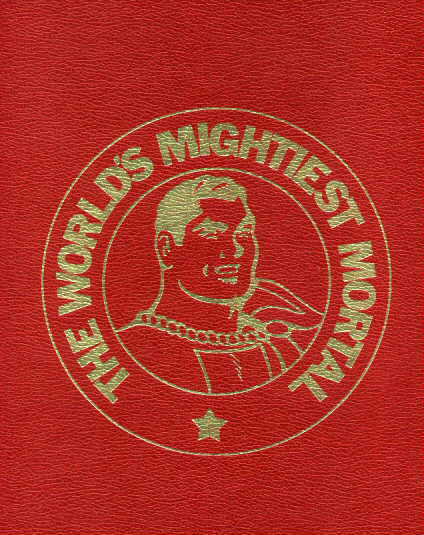 The cover of the book itself is black with the title "The Monster Society of Evil" in big red letters with a headshot of the World's Mightiest Mortal on the back cover. The book is then packaged in a red leather slipcase (cover shown above) and the back cover has a large gold thunderbolt. 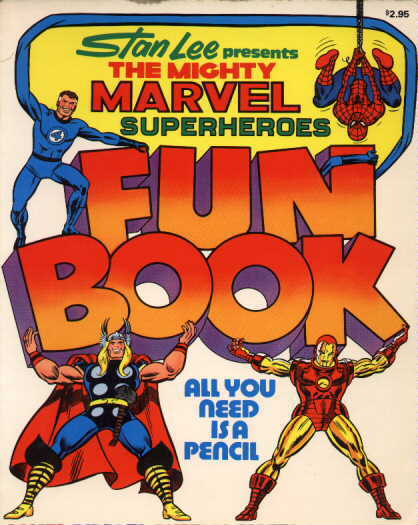 Childrens style book that teaches youngsters reading techniques using Superhero images on every page. The Yellow Kid, Mutt and Jeff, Donald Duck, Superman, Batman, Captain Marvel, Captain America, the Fantastic Four, Spider-Man, Crime Does Not Pay, Tales from the Crypt, Mad, Zap, Walt Disney, Carl Barks, Stan Lee, Harvey Kurtzman, Robert Crumb. 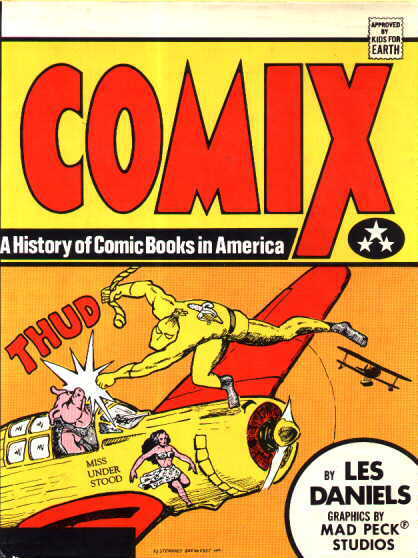 Comix covers the whole history of comic books in America - the major creations, the major creators, the major comic book lines, the major comic book enemies. 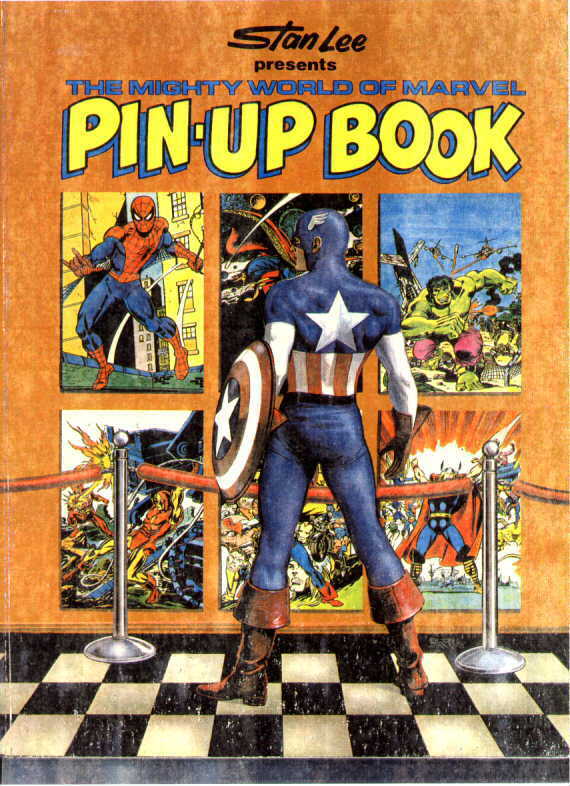 With wide knowledge, affection and a good sense for the illuminating detail, the co-authors - Les Daniels and the Mad Peck - tell the story of how comic books captured the imagination of millions and became an American institution, and whether or not they deserved it. 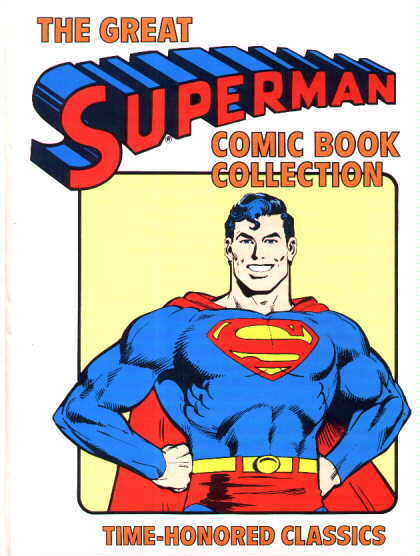 Similar to the "Superman from the 30's to the 70's" book, this reprints some of Superman's greatest stories from over the years. 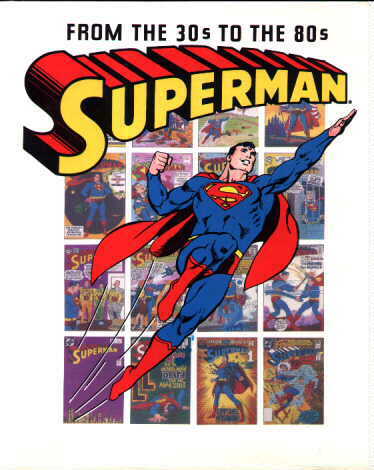 Included is his origins, how Superboy met Lex Luther, first Supergirl appearance, 3 part story of Superman's return to Krypton, Lois Lane story, Jimmy Olson story, first Brainiac and Luthor team story line, and many others. 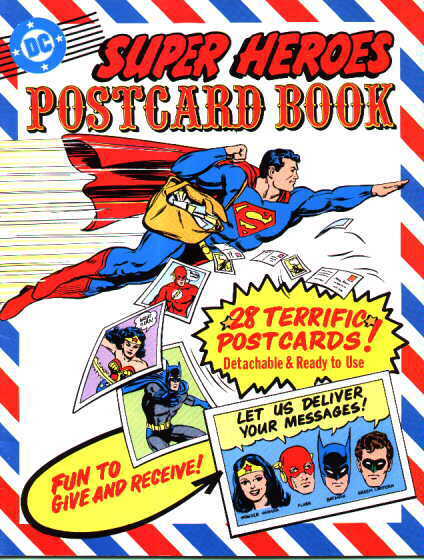 Images from DC's past are used on 28 different postcards, using various characters. 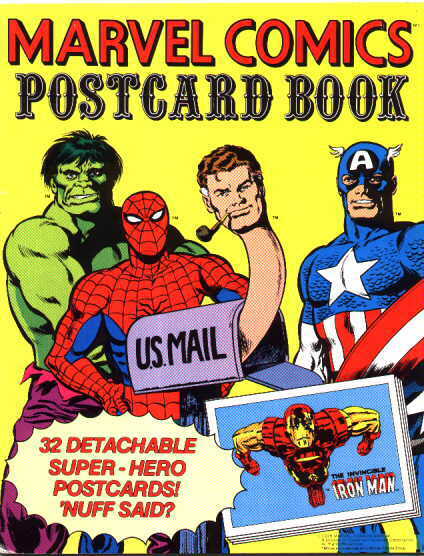 Images from Marvel's past are used on 32 different postcards, using various characters. There are a few gaps in my collection that I am actively looking to fill. If you have a copy of any of the books I have named above for sale please send me an e-mail. If you come across a Fireside or Superhero related book I have not listed, please e-mail me with the information on the book and a scan if possible (50% size-100 DPI). 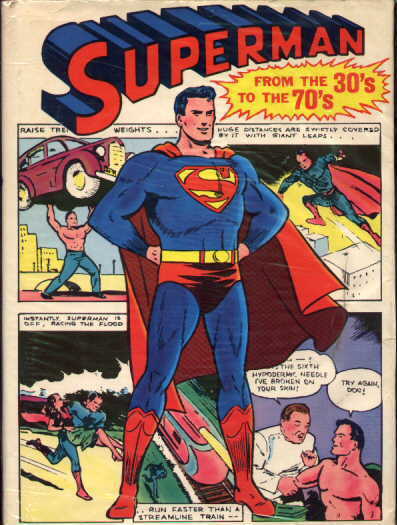 I am particularly interested in purchasing a copy of "Shazam from the 40's to the 70's", "The Great Superman Book", and any hardcover Fireside book. I am not offering any of my books are for sale, but I am always trying to add to my collection. Many sellers of these books have stated that they do not know how to identify what number printing a book is. This is very easy to determine by checking the title page. If you see the numbers 1 through 10 printed on this page (or letters a through j), you have yourself a first printing. If, for example, the number 4 through 10 are printed (d to j), you have the 4th printing. Don't be fooled by sellers who say, "It appears to be a 1st printing." Have them verify it! Enough of my ranting and I hope you have enjoyed seeing the covers of the books themselves. Good luck hunting to you Fireside collectors. For all others, I hope you enjoyed the page! Visit my Neal Adams Homepage! This page has been visited times since April 1998. Click here to send me your comments or suggestions!